The Euclid Tavern, a little venue in Cleveland, came to rock prominence in 1989 when a local artist, Derek Hess, began booking Monday night shows there. Previously, the club had been just a weird bar and the setting for the 1987 Michael J. Fox/Joan Jett vehicle Light Of Day, but in 1989, Hess started putting weird, obscure up and comers in the club, ones that would grow to become national names, and within a few years, “The Euc” was a big deal not only in Cleveland but in the nation’s rock scene. The original venue closed in 2001, re-opening in 2008 under new ownership and minus all the original crud and cred. 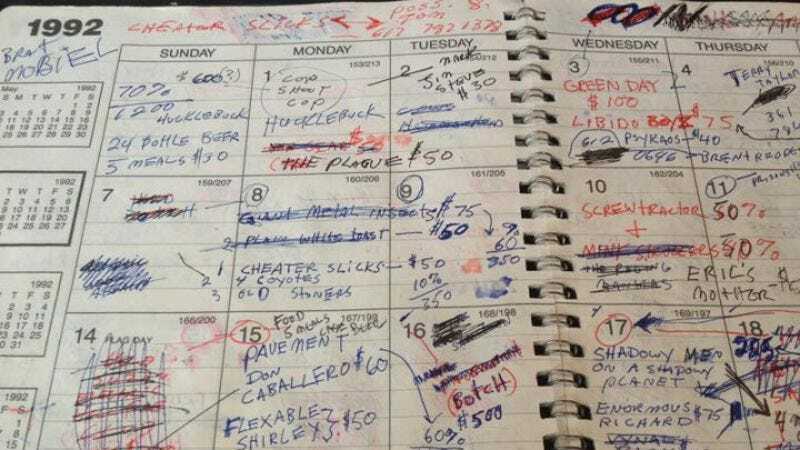 The memories live on, though, especially since last week, when Hess posted two photos of his planner from when he was booking the club. In the planner, which appears to be from 1992, Hess made notes about who was playing each night, as well as how much he was paying them and any other special requests. Pavement, for example, needed meals for five guys and a case of beer when they played with opener Don Caballero, who got paid a sweet $60. Green Day, playing a Wednesday night a couple of weeks earlier, rolled away from the club with a fat $100 paycheck. By contrast, when Ween played a few months earlier, the band got paid $300 for its Wednesday night set. The calendar pages are a little messy and hard to decipher, but they’re a fascinating snapshot of an era, a venue, and a scene.